This scene from a Regatta Place Wedding is like a scene from Cinderella. Regatta Place is located on the historic Goat Island of Newport, Rhode Island, and is situated in the heart of the Goat Island Marina. A Regatta Place Wedding offers the perfect setting for an elegant, waterfront reception in Newport. A wedding reception at the Regatta Place is notable for the cream and white striped tent that it is held in. The tent is adorned with a cream swathe ceiling, billowed draperies and striking chandeliers. This photo from an exquisite Newport wedding at this venue shows the bride and groom standing outside Regatta Place under twinkling lights that are strung overhead. The photograph has been shaded in black and white to highlight the figures of the newlyweds against the dark, rainy night that surrounds them. 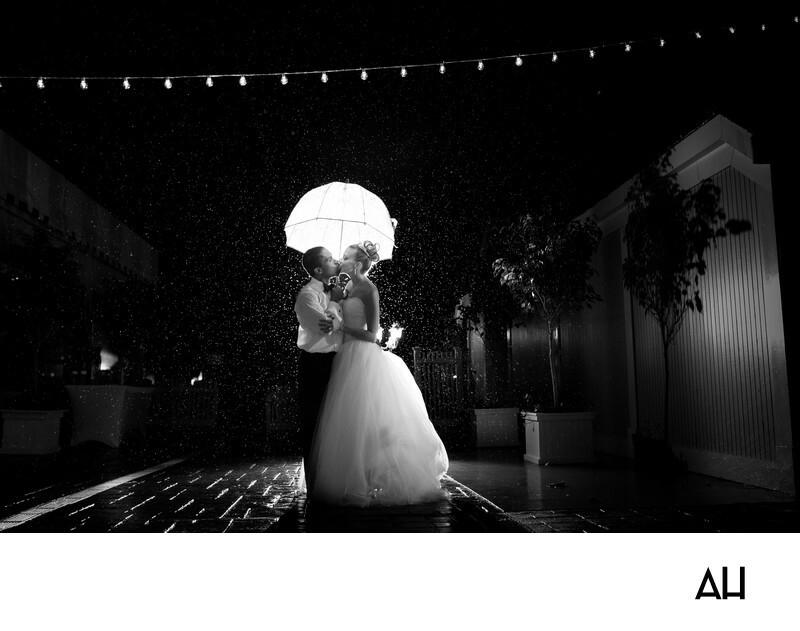 In the image rain drops sprinkle over the couple like fairy dust, but they stay dry beneath a white umbrella. No couple wishes for rain on their wedding day, but as a photographer I find that some of the most beautiful, creative, and unique wedding portraits come from rainy day celebrations. At this point in the evening the rain had turned into a light mist. It was a summer night, so the couple did not mind being outdoors with the rain falling around them. The ground has become slick and the stone walkway beneath the bride and groom’s feet glistens under the lights that hang above them. Beneath the umbrella, the couple shares a tender moment, kissing in the rain and holding one another close on their very special day.